This wonderful kit includes the Nomad Cargo trailer which is a two-wheel cargo trailer capable of packing an astounding amount of storage and weight and the Nomad Cargo Rack which fits perfectly atop the Nomad Cargo trailer allowing you to expand the storage capacity. An affordable and convenient kit for any active parent. Dimensions: Weight = 14.5 lbs, 6.6 kg. Capacity = 100 lbs, 45 kg. Folds to: 32.5 x 19 x 9in (82.5 x 48.3 x 22.9 cm). 16 inch quick-release alloy wheels, with new wheel guards. 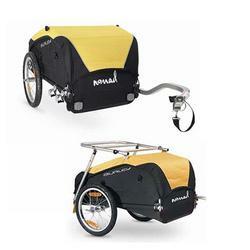 Features: Large carrying capacity with removable inside space divider and pockets. Low tongue weight design wont compromise bike handling. Easy to clean fabric. Safety flag included. This wonderful kit includes the Nomad Cargo trailer, a two-wheel cargo trailer capable of packing an astounding amount of storage and weight, and the Nomad Cargo Rack, which fits perfectly atop the Nomad Cargo trailer allowing you to expand the storage capacity. An affordable and convenient kit for any active parent.